With Mists of Pandaria around the corner, Blizzard changes classes and improves "quality of life" in Azeroth. World of Warcraft debuted in November 2004. When the fourth expansion Mists of Pandaria hits, the MMO will be nearly 8 years old. Anything that ancient in videogame time has to reinvent itself to stay current, and WoW has seen quite a few alterations to its lore, code and core game mechanics over the years. Patch 5.0.4 is no different. Released on the servers yesterday, this patch introduces a new talent system for each class, alters the buff system and lets you level up in zones with players from other servers to keep the population feeling full. Perhaps the most anticipated changes are those that just fine-tune the game experience for WoW players, such as finally allowing you to loot all the stuff around you instead of just one bag at a time. The changes to the nine classes will be some of the most discussed by the vocal player base on the official WoW forums. Blizzard Community Manager Bashiok explains just how much your rogue or paladin will change. "A number of changes have been made that can impact how you play your class," he said. "These range from minor to major, but almost all specs have altered rotations, and a few have been completely redesigned. Once the patch launches be prepared to spend a little time reacquainting yourself with each ability, and setting your action bars up." For example, the hunter class can now attack with bows or guns from any range - there was a minimum distance required before - and the pets the class uses no longer have their roles restricted by type. Any animal - be it a gorilla, a turtle or a dinosaur - can now have the Ferocity, Tenacity, or Cunning specialization. Also, druids have a fourth talent spec, splitting up the Feral talent tree between Cat and Bear druids. You can read the full patch notes on Blizzard's site and the Patch 5.0.4 Survival Guide which outlines the class changes here. 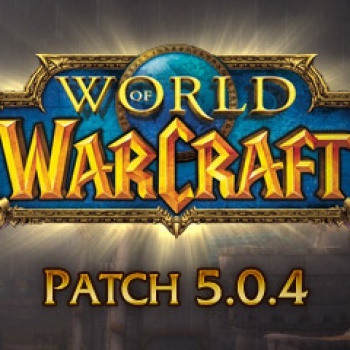 I spent about 12 hours downloading the beta for Mists of Pandaria so I could check out the changes, but most current WoW players have been downloading the patch in the background for the last week or so and 5.0.4 went live as of yesterday. How has the patch impacted your game so far?